[145 Pages Report] The overall protective systems market is projected to grow from USD 101 million in 2018 to USD 292 million by 2023, at a CAGR of 23.6%. The use of protective cultures follows the increasing market trend of clean label products. The demand for increasing shelf life and enforcing higher transparency and traceability standards is expected to favor the growth of protective cultures in the food industry. The protective cultures market has been segmented on the basis of product form into freeze-dried and frozen. The market for freeze-dried cultures is projected to record the higher CAGR between 2018 and 2023. Freeze-dried cultures are easier to maintain and transport, while also maintaining the stability of the cultures. They are easier to store and are comparatively inexpensive, without the need for significant additional cold-chain support. 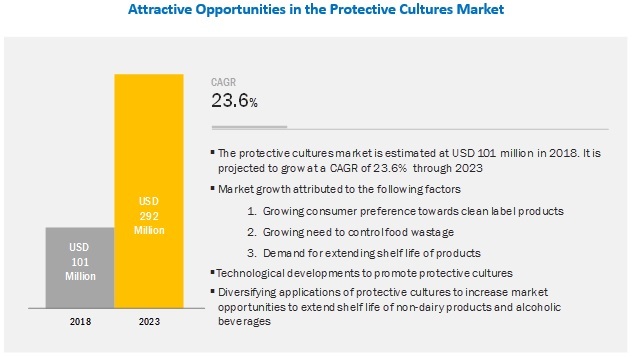 The protective cultures market is segmented on the basis of application into dairy & dairy products, meat & poultry products, seafood, and others. The market for seafood is projected to record the highest CAGR between 2018 and 2023. The increased production and processing of seafood for exports has had a positive impact on the market. The dairy & dairy products segment is dominant in the applications segment due to the growth of protective cultures in the cheese industry. The protective cultures market is segmented on the basis target microorganisms into yeasts & molds and bacteria. The market for cultures that protect from yeasts & molds is projected to witness a higher CAGR between 2018 and 2023. The market for protective cultures in the dairy industry is significant and is primarily used in cheese manufacturing. Yeast & mold spoilage is a major factor affecting the quality and use of cheese products. The use of protective cultures has helped extend the shelf-life for these products to benefit cheese producers. 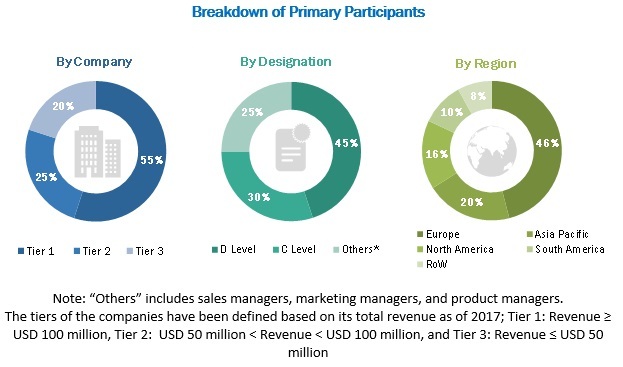 The European protective cultures market is estimated to be the largest for protective cultures, while the Asia Pacific market is projected to grow at the highest CAGR. The rise in demand for clean label products and the need for better transparency and traceability in food is aiding the growth of protective cultures in the region. Europe also hosts the largest concentration of producers in the protective cultures industry, with major industry leaders maintaining their operations in the region. Key players in the market include CHR Hansen (Denmark), DowDuPont (US), Sacco S.R.L (Italy), CSK Food Enrichment B.V. (Netherlands), THT S.A. (Belgium), Dalton Biotechnologies (Italy), Biochem S.R.L (Italy), Meat Cracks Technology GmbH (Germany), Royal DSM N.V. (Netherlands), Bioprox (France), Aristomenis D. Phikas & Co SA. (Greece), and Soyuzsnab Group of Companies (Russia). These players are undertaking a strategy involving new product launches and expansions to improve their market position and extend their competitive advantage. In November 2018, DSM expanded its Delvo Guard protective cultures to reinforce safety standards for clean label products. The culture was designed to prevent the formation of yeast and mold in dairy products to extend the shelf life of products without any effect on the taste and texture. In October 2018, the DuPont Nutrition & Health Team in South America launched the DuPont Danisco Lactobacillus Plus, which combines strains of L. paracasei, L. helveticus, and L. acidophilus in the production of fermented milk. These strains provide a better balance in terms of flavor and acidity, while optimizing the production process through rapid fermentation. What are the upcoming industry applications for protective cultures? What is the impact of the dairy industry on protective cultures? What are the new technologies being introduced in protective cultures? What are the latest trends in protective cultures? 12.5 CSK Food Enrichment B.V. The study involved four major activities in estimating the market size for protective cultures. Exhaustive secondary research was conducted to collect information on the market, peer market, and parent market. The next step was to validate these findings, assumptions, and sizing with industry experts across the value chain through primary research. Both top-down and bottom-up approaches were employed to estimate the complete market size. Thereafter, market breakdown and data triangulation were used to estimate the market size of segments and subsegments. In the secondary research process, various secondary sources such as Hoovers, Bloomberg BusinessWeek, and Dun & Bradstreet have been referred to, so as to identify and collect information for this study. These secondary sources included annual reports, press releases & investor presentations of companies, white papers, certified publications, articles by recognized authors, gold & silver standard websites, food safety organizations, regulatory bodies, trade directories, and databases. The market comprises several stakeholders such as raw material suppliers, processors, end-product manufacturers, and regulatory organizations in the supply chain. The demand side of this market is characterized by the development of the food & beverage& dietary supplement, and feed industries and the growth in population. The supply side is characterized by advancements in technology and diverse application industries. Various primary sources from both the supply and demand sides of the market were interviewed to obtain qualitative and quantitative information. Given below is the breakdown of the primary respondents. After arriving at the overall market size using the market size estimation processes as explained above the market was split into several segments and subsegments. In order to complete the overall market engineering process and arrive at the exact statistics of each market segment and subsegment, the data triangulation and market breakdown procedures were employed, wherever applicable. The data was triangulated by studying various factors and trends from both the demand and supply sides in the food, feed, and pharmaceutical, nutraceutical, and personal care industries.